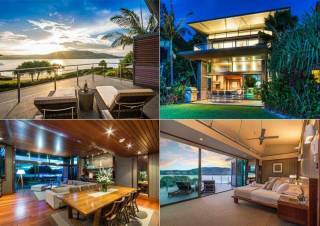 Heliconia One is a tropical island style villa set amidst the lush western hillside of Hamilton Island. 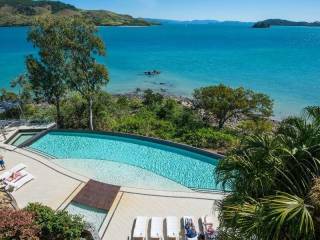 Just like the flower that this property is named after, the villa is perfectly placed within the tropical beauty of Hamilton Island, where the breath-taking views of the Henning and Whitsunday islands and the ever changing skyline mean that you wont want to leave this home-away-from-home. Combining rest and relaxation with style and spaciousness, the master bedroom opens up to the balcony, and is furnished with a comfortable king sized bed and ensuite, while the second bedroom also has a queen sized bed, and the third bedroom has a queen bed which can be split to 2 single beds upon request plus a trundle bed. These bedrooms share the main bathroom, which comes with a large bath and shower. Another roll-away bed, cot or high chair can be arranged upon request. If your are wanting your trip to Hamilton Island to be all about style, convenience and comfort, then Heliconia One is definitely the perfect villa to take you on that unforgettable holiday journey. For your added security, this property., Heliconia One is only managed in Australia and we never request payments be made to overseas bank accounts. Additional Roll-Away Bed, Cot or High Chair can be arranged upon request.